The IRS Form 1098T is an informational return that JHU Krieger School of Arts and Sciences and Whiting School of Engineering is required to issue to assist you in determining your eligibility for claiming educational credit. You will receive this statement for amounts paid for “qualified educational expenses” for the previous calendar year activity (January through December). IRS Publication 970 defines “qualified educational expenses” as tuition, fees, and books. The 1098-T can be obtained electronically by clicking the View 1098-T link and providing consent via the SIS portal. It will be mailed by US Postal Service by January 31, to eligible students who have not consented to receive it electronically. Please read the attached PDF Document: information about a change in the 1098-T process for calendar year 2018. Please login to SIS Self-Service to access your 1098T. Go directly to Billing>Summary or Billing Statement Tab. The IRS Form 1098‐T is an informational return that JHU Krieger School of Arts and Sciences and Whiting School of Engineering is required to issue for the purpose of determining a student’s eligibility for an education credit or tuition and fees deduction. Refer to PDF Document: IRS publication 970 and PDF Document: Tax Benefits for Education: Information Center for further information regarding the 1098‐T, or consult your tax advisor. Please note: JHU Krieger School of Arts and Sciences and Whiting School of Engineering or the JHU Tax Office cannot answer tax questions or advise you concerning tax-related issues. Who is required to be issued an IRS Form 1098‐T? 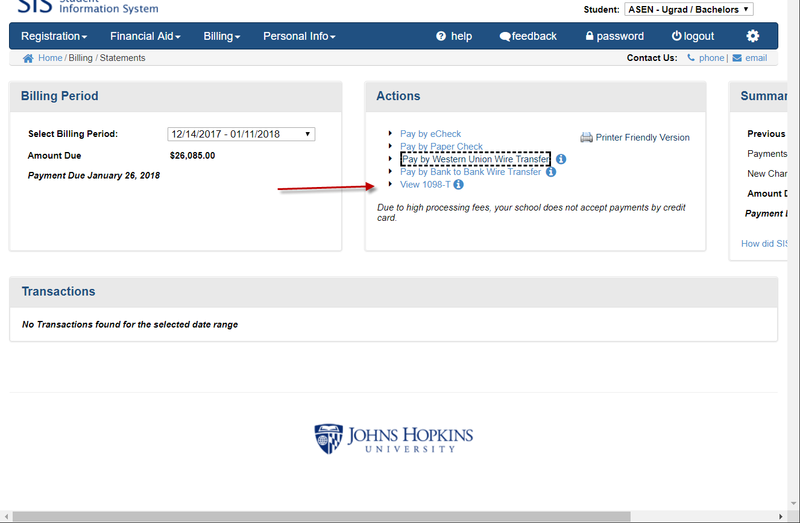 JHU Krieger School of Arts and Sciences and Whiting School of Engineering must file a 1098‐T form for each enrolled student for whom a reportable transaction was made during the calendar year January 1 to December 31. 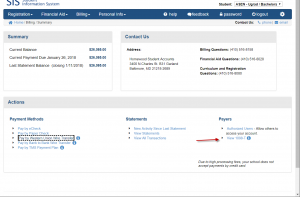 A reportable transaction is defined as qualified tuition and related expenses required for a student to be enrolled at or attend an eligible educational institution and any scholarships or grants administered and processed for payment of the student’s cost of attendance. Who is NOT required to be issued the IRS Form 1098‐T? Students enrolled in courses for which no academic credit is offered, even if the student is otherwise enrolled in a degree program. Students whose qualified tuition and related expenses are entirely waived or paid entirely with scholarships and/or other formal billing arrangement between an institution and the student’s employer, government entity, such as the Department of Veterans Affairs or the Department of Defense. 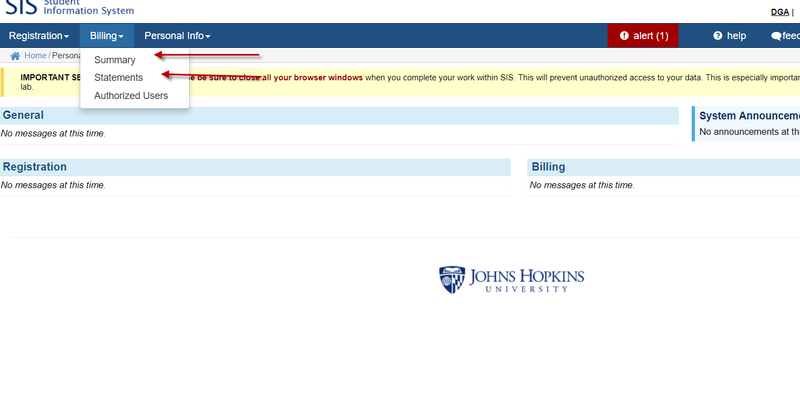 Does JHU Krieger School of Arts and Sciences and Whiting School of Engineering report my payments? Due to an IRS requirement change, beginning with calendar year 2018, educational institutions must report based on payments received for qualified education expenses within the tax year. This is reported in Box 1 of the Form 1098-T. However, the amount reported on your Form 1098-T, box 1, might differ from the amount you actually paid and are deemed to have paid. The IRS reminds the taxpayer, “When figuring an education credit, use only the amounts you paid and are deemed to have paid during the tax year for qualified education expenses.” To get a summary of your charges and payments by term, you can view and print your account activity in SIS or contact our office for more detailed information by calendar year. Please look closely at the dates of activity. How does a student receive IRS Form 1098‐T from JHU Krieger School of Arts and Sciences and Whiting School of Engineering? If you elected electronic delivery of your 1098‐T form, you will receive an e‐mail notification alerting you when your 1098‐T is available for download at 1098T.com. You can elect this option by logging on to www.1098T.com. 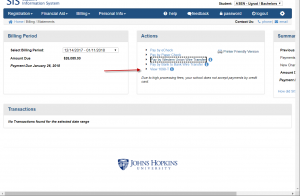 If you did not choose electronic delivery, the 1098‐T form will be mailed to your last known permanent address of record provided to JHU Krieger School of Arts and Sciences and Whiting School of Engineering as of December 31. If you have not received the form by the middle of February, please contact Tax Credit Reporting Service by Xerox (TCRS) at 1‐877‐467‐3821. You can also download your 1098‐T form at 1098T.com. 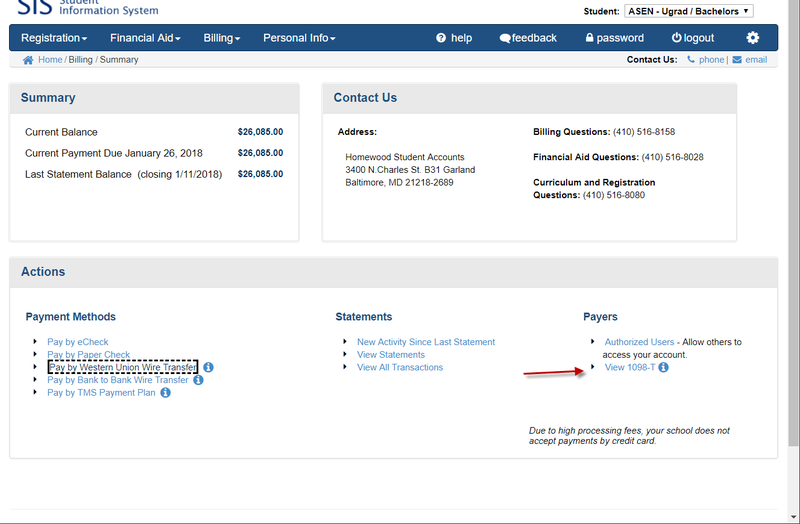 If there is an error in the financial or demographic data reported, you need to contact JHU Krieger School of Arts and Sciences and Whiting School of Engineering’s Student Accounts Office or Registrar Office so that the error can be corrected, if necessary, and a corrected Form 1098-T can be created and issued. 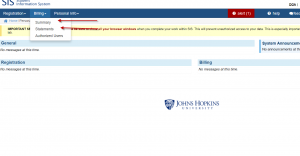 JHU Krieger School of Arts and Sciences and Whiting School of Engineering does not mail duplicate or corrected 1098‐T forms. You can download and print a duplicate or corrected 1098‐T form at www.1098T.com including for previous years as far back as 2010. I have a general question about my 1098‐T form. Who can I call for help? JHU Krieger School of Arts and Sciences and Whiting School of Engineering contracts with a service provider to process, mail, and answer general questions pertaining to IRS Form 1098‐T. During peak season from Feb 15 to April 29 you can reach TCRS customer service from 11 a.m. to 8 p.m. Eastern Time, Monday through Friday. For off-peak times, you can reach TCRS customer service from 9 a.m. to 5 p.m. Eastern Time. Our service provider can be reached at 1‐877‐467‐3821.